This is the Best Peanut Butter Frosting Recipe you’re going to find. It’s sweet, creamy, peanut buttery PERFECTION made with peanut butter, butter, powdered sugar, vanilla, and heavy cream! 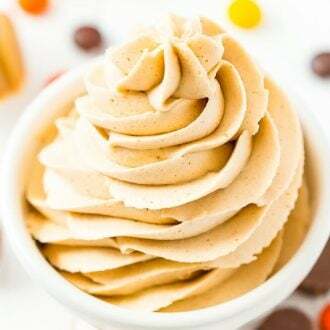 This is the Best Peanut Butter Frosting and the ultimate frosting for cakes, cookies, and more! Happy Friday, friends! What’s everyone got going on this weekend? I’ll be in the kitchen, not like that’s anything new, though, that’s pretty much every weekend around these parts. 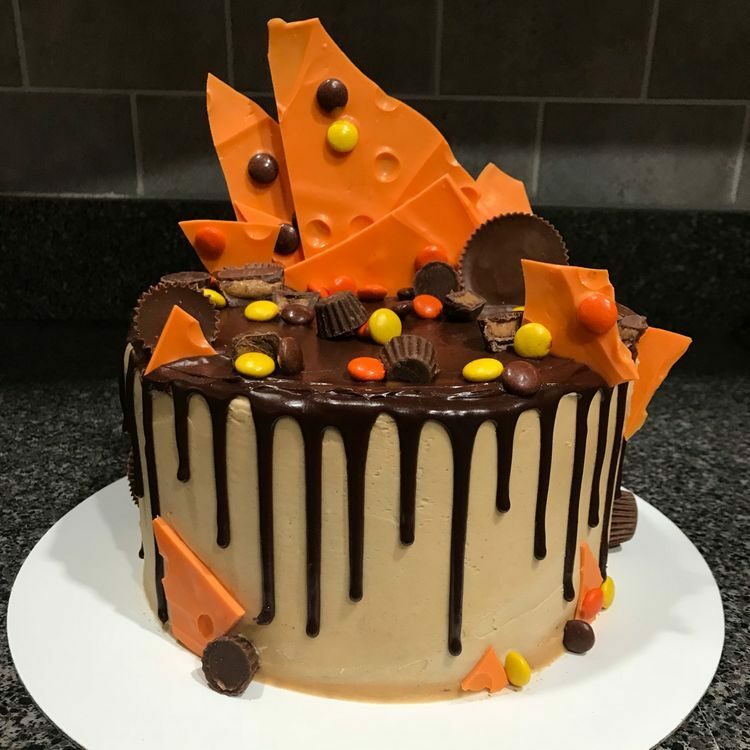 As a baker, I spend a lot of time in the kitchen. Sometimes I’m crying over my fifth failure that day or rejoicing in the amazingness that just came out of the oven. Every weekend is a baking battle, sometimes I win and sometimes I lose. Buy a KitchenAid Paddle Attachment! It Really Is The BEST Peanut Butter Frosting Ever! I love my cookies and I have so much fun with my cupcakes, but it’s my frosting that’s ON POINT! Sure, a good cake is important, but it’s the frosting that MAKES it. I’ve learned that a killer frosting can save the day and that it can turn a boring box mix into something AWESOME! 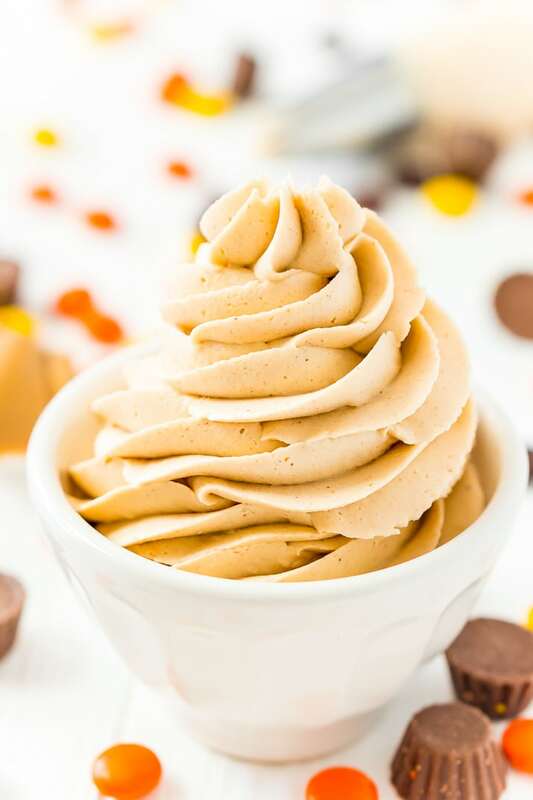 This is the best peanut butter frosting around, it’s so creamy and smooth with the perfect balance of sugar and peanut butter. Buy My Favorite Piping Tip! Unsalted Butter – You want to use unsalted when it comes to most dessert recipes, but especially in this one since the peanut butter itself has a lot of saltiness and we don’t want this frosting to be overly salty. It’s also very important that the butter is at room temperature, you should be able to press the back of a spoon easily into the butter. 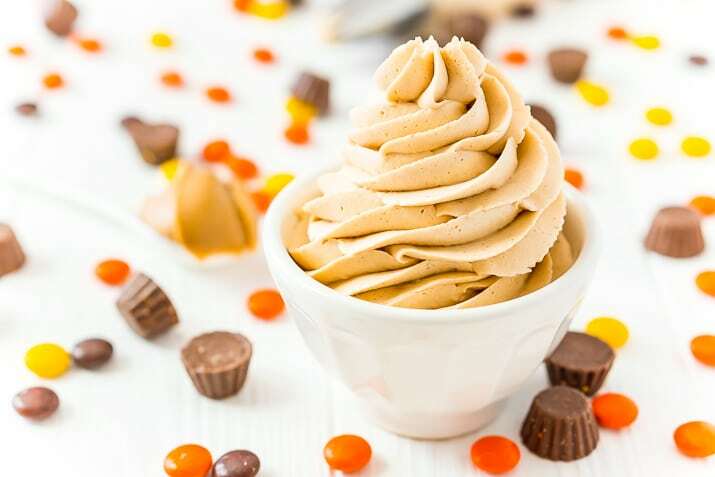 Peanut Butter – You obviously can’t make peanut butter frosting without the peanut butter. You want to use creamy peanut butter, I personally prefer Jif. 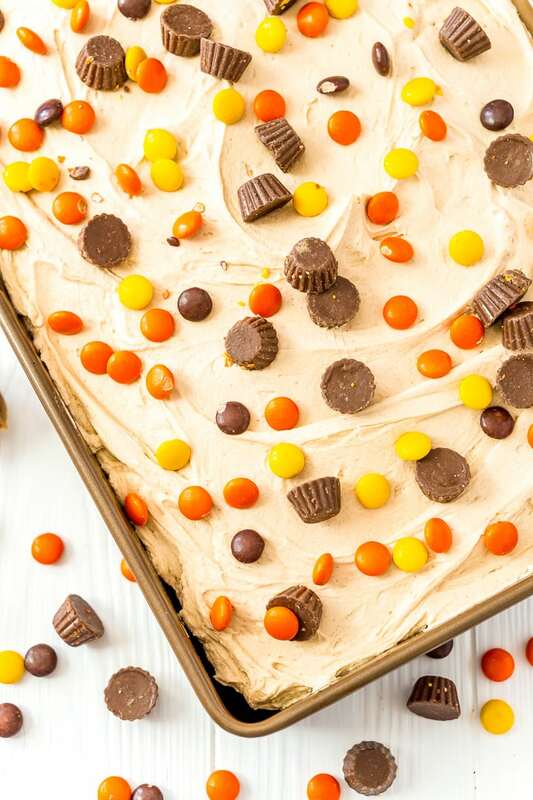 Please note that all natural peanut butter that separate may not be the best fit for this recipe as they don’t hold up quite as well in confections over time. Powdered Sugar – You’ve got to lighten up the salty peanut butter with something sweet and powdered sugar is just the way to do it. Make sure your powdered sugar isn’t old and hard, you need it to be fine and fluffy, sift it first if you need to. Vanilla Extract – Vanilla is such an essential ingredient in the kitchen and especially in frostings. It helps to add a great depth of richness to almost any recipe! Make sure to use good quality vanilla or make your own at home. Heavy Cream – While this is the best cream form to use, it’s my understanding that it can be hard to find in some parts of the country, in that case, whipping cream will do just fine. What we’re really after is that thick, rich, creamy component that milk and water just don’t provide. 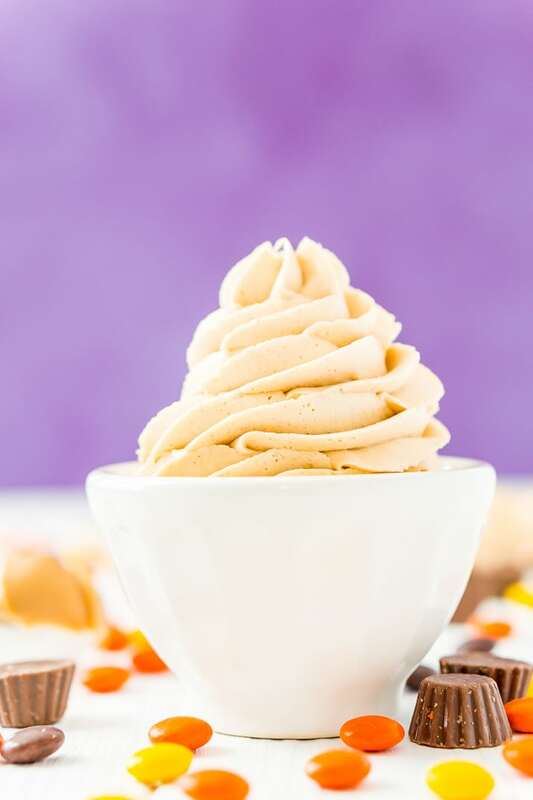 Using heavy or whipping cream allows for a night whip during the mixing process which yields a light and fluffy frosting everyone is sure to go crazy for! I Make This Frosting A Lot! 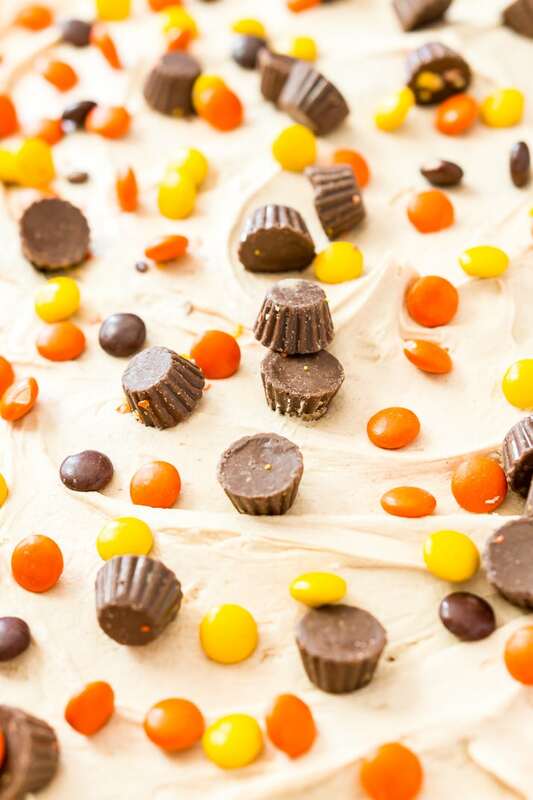 You guys first saw this recipe on my Chocolate & Peanut Butter Surprise Cupcakes and then again on my Billionaire Bars! Sometimes I just eat it straight, because it’s peanut butter awesomeness! 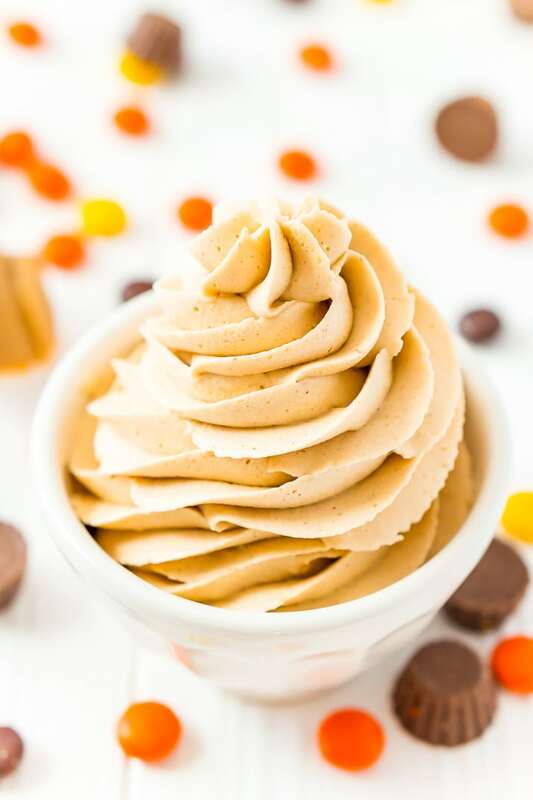 So if you need to frost a cake or fill some whoopie pies, this is the peanut butter frosting you want! Mixing – I find it best to make this frosting in a stand mixer with a whisk or paddle attachment, the high power can whip this recipe into the fluffy gloriousness that makes it so great. In a pinch, a hand mixer will do just fine! Vanilla – I generally prefer to add my vanilla or extract to frostings in the beginning when I’m creaming the butter, this means it’s there throughout the entire mixing process and melds with all of the other ingredients. Creaming – The butter and the peanut butter gets creamed together first to make sure that they are completely combined before adding any other ingredients. 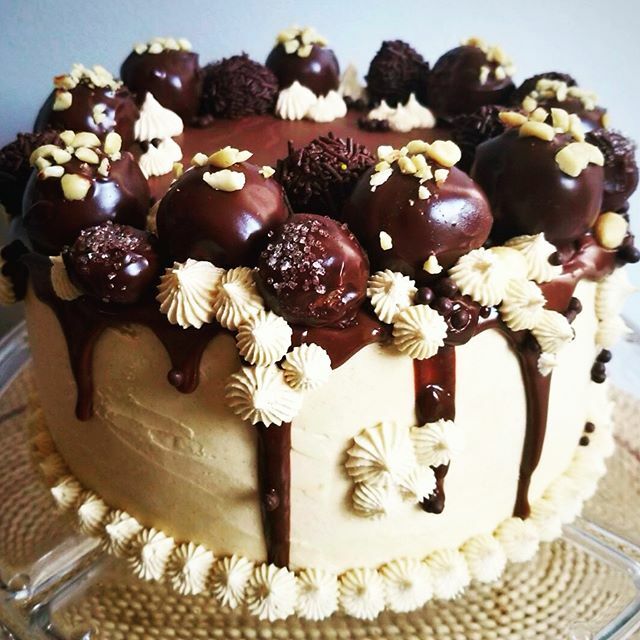 Sugar – When it comes to any buttercream, you want to add the sugar in batches, this allows the sugar to mix more thoroughly and usually prevents it from flying all over the kitchen. Liquid – It’s important to add liquid in small doses for a couple of reasons. One, it can splash everywhere if you add too much at once. Two, the liquid can impact the texture of frosting really fast. I like to add my heavy cream to this recipe about a tablespoon at a time until I reach the desired consistency. Does Peanut Butter Frosting Need To Be Refrigerated? The small amount of heavy cream is stabilized by the amount of sugar in the recipe. And is considered safe at room temperature for two to three days. “My search is over. I’ve been looking for a good frosting recipe but I’ve always found that peanut butter seems to make any frosting gritty and not so smooth and creamy. This one is superb! It was light and creamy! Must be the cream because that’s the only difference from all the others I’ve tried in the past. Thanks for a fabulous recipe!” Rose P.
More Praise For This Frosting Recipe! “I made this for my Mums 70th Birthday and she LOVED IT! Said it was as creamy as peanut butter fudge! Bravo!” – Jill H.
I hope you try this recipe and I hope you love it as much as everyone else does! It’s absolutely amazing! More Delicious Frosting Recipes You’ll Love! This post was originally published on March 25, 2015. The post was republished on September 23, 2017. Updated September 5, 2018 with new photos. 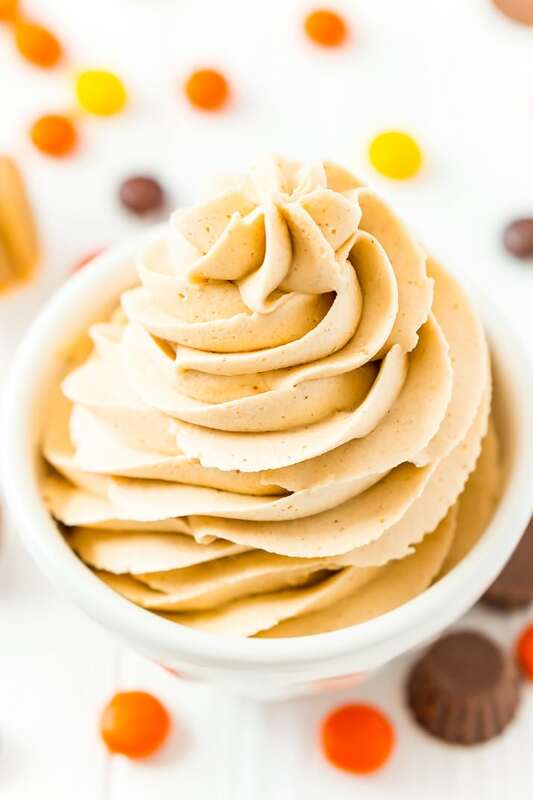 This is The Best Peanut Butter Frosting Recipe you're going to find. It's sweet, creamy, peanut buttery PERFECTION made with peanut butter, butter, powdered sugar, vanilla, and heavy cream! Cream Butter using a paddle attachment. Add vanilla and peanut butter and beat until well mixed. Add confectioners' sugar a cup at a time, alternating with heavy cream. Whip on medium-high speed for 2-3 minutes until frosting is light and fluffy. Add additional cream or confectioners sugar as needed to reach desired consistency. Frosting can be made with a hand mixer but will not be as whipped. Oh my word- this was fantastic. I had another recipe I used for years but wanted to try yours. Light fluffy yummy perfection!!! So glad you loved it, Rachel! Will this recipe work with natural peanut butter? Hi Sara, I have personally never tried it, but it tends to be oilier and I believe it can cause separation over time or make the frosting slip. Just something to consider if you decide to try it. I’m so glad you enjoyed it, Jennifer! Not having any cream, I omitted the vanilla and used liquid French vanilla coffee creamer, and it was FANTASTIC! Thanks for the recipe! So glad you enjoyed it, Kathy! What a great substitute! Hi Chelsea, I’m so glad you enjoy the recipe and I’m glad you were able to alter it to meet your dietary needs! I’m planning to use this on my chocolate banana cupcakes. I’m thinking they should be refrigerated after decorating because of the cream? How does the frosting hold up after it is at room temp for a while? Hi Cathy, the frosting will hold up just fine at room temperature 🙂 Make sure to cover them overnight in a container if you have leftovers. You can also store them in the fridge if you would like, but it’s not necessary. Also, just be sure that it’s room temperature and not too hot or humid as this could cause the frosting to break now that summer is upon us! Is this frosting more peanut buttery or more sweet? Looking for a frosting where the peanut butter flavor really stands out! This is the sweetest frosting I’ve ever tasted….so you might want to go with a different recipe. Looks terrific, going to try it now! From the post and the reviews, doesn’t look like I could go wrong choising this recipe. Could you please tell me what kind/brand of peanut butter you use? I don’t see it mentioned anywhere. I’m concerned that the extra ingredients (sugar, salt, molasses, etc.) in the “store bought, childhood” peanut butter, will interfere somehow, or is that what you use? Thanks, and thanks again for this post! Hi Alisha, I prefer JIF creamy peanut butter, but I would think any store bought creamy peanut butter would work fine. I know some readers have had issues with the all-natural peanut butters because they tend to have more oil in them and it can cause the frosting to separate. Also, don’t use crunchy. I just made this for my daughter’s homecoming party. It was awesome! I frosted chocolate cupcakes with this and 15 teenagers couldn’t get enough, not to mention my husband. So good and perfect to pipe with!! I’m so glad everyone enjoyed it, Shannon! Incredible recipe! My husband proclaimed it as his favorite buttercream ever! Very easy to work with and a great consistency. Cannot recommend this recipe highly enough! It does make a smaller amount, so I needed to double it last minute. I used Jif Creamy Peanut Butter with zero issues. Hi Jennifer, so glad you all loved it and you got some wife brownie points out of the deal! There are so very many recipes available but when I tried this one it instantly became a favorite. I mixed exactly as instructions said and it is always delicious. I did sift sugar first and it did not take the same amount as when it is unsifted so it was perfect – Not overly sweet, peanut buttery taste, and held stiff peaks just like the picture showed. Such a perfect recipe. I’m so glad you’ve found you new go-to peanut butter frosting! This frosting is perfect, thank you so much for sharing. I made it just like the recipe only I doubled it because I was decorating 2 layer cakes! I couldn’t stop eating it! I’m so glad you enjoyed it, Angie! Is this recipe enough to frost an 8″ 2 layer cake?